Providing you the best range of mass mixer and double cone mixer with effective & timely delivery. 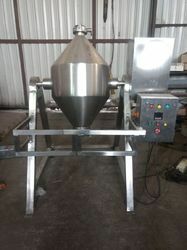 Mass mixer ideally used for mixing both wet & dry materials to provide uniform mixing. Designed with utmost precision & perfection our offered mass mixers are used for mixing & blending purposes. 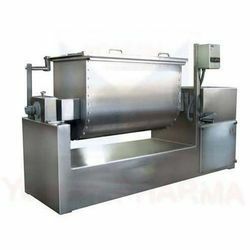 The Mass Mixer Machine is basically mixing an assembly wherein the mixing stirrer is in horizontal position in the container & has a single speed, simple rotation. The stirrer rotates around itself at a very slow speed inside the bowl and thereby achieving intimate mixing of dry or wet materials of Tablet Granulation, Powder, Chemicals, and Food & Confectionaries Materials. Because of a special design feature of machine & stirrer, the mass mixer can be mix the sticky materials & also uniformly and intimately mix the materials which are to be difficult to mix. Anvay Pharma manufactures the Double Cone Mixer for mixing & blending of various pharmaceutical products, food, and chemical products. Double Cone Mixer ensures with its double cone shaped bin efficient blending suitable for specified user's requirement. The cone is statically balanced to avoid any excessive load on the gearbox and motor.